What's new this week in Ambition? The Ambition team works to improve our platform every day. These updates include everything from major improvements down to the smallest bug fixes. Here are the main changes that will be visible to you. If you have additional suggestions for improvement, please let us know. Be on the look out for new release notes every Friday morning! Upgrade to TLS 1.2 - As we continuously improve the security on our platform, we updated from TLS 1.0 to TLS 1.2 on March 28th. To prevent any service interruptions, please confirm that your Ambition API integration uses a web client that supports TLS 1.2. If you need any assistance, please contact us at gethelp@ambition.com. Consistent use of decimals and commas. Improvements to the multi-selector for multiple metrics or hierarchy levels. Groups (roles, locations, or teams) can now be viewed in Quadrant mode. Smart-Title generator for reports (found in the report's header). Click here for a comprehensive overview. Accolades Time Zones - Accolade achievements now have improved time zone support. Grid Search Bar - The search bar's styling has been returned to its original format. Viewing Uploaded Files - Uploaded files that contain non-standard characters can now be viewed in the data explorer. Average Activity Score & Objective Score - In spreadsheet mode, both Activity and Objective Scores are now averaged in the totals row, allowing for easier comparisons. Previously, both were summed instead of averaged. Dashboard Record Grids - Dashboard metric record grids, by default, now show the records that are actually counting towards the metric first (users can remove this filter if desired). Previously, we weren’t filtering to only show successful records by default. Updated Search Bar - The search feature has been updated to provide a better and faster search experience. Updates include the ability to search with qualifiers like (User) and (Team). Analytics - We have released several small updates to improve the overall user experience for Analytics, which is still in the Early Access Program. Dashboard Header Mobile Responsiveness - The Dashboard has been improved to be more responsive on mobile devices. Additionally, the profile picture has been changed to a square instead of circle. Trigger Email Message - Previously, trigger emails were not properly formatting or rounding numbers. For example, 54.23% will now show in an email instead of the raw value of 54.234542354235432. Daily Digest - Users who don't have direct reports will no longer receive a blank Daily Digest email. Optimized Dashboard Scorecard Widget - The Scorecard widget (Activities and Objective visualization) has been rebuilt to significantly decrease the average load time for the Organization Dashboard. For larger organizations, the time to load has been decreased 7x. Upgraded Queuing System - Our queuing system's code has been fixed to improve the user experience. Although not common, this fix prevents recently created objects, like Goals, from getting backed-up in que and not showing up for an extended period of time. 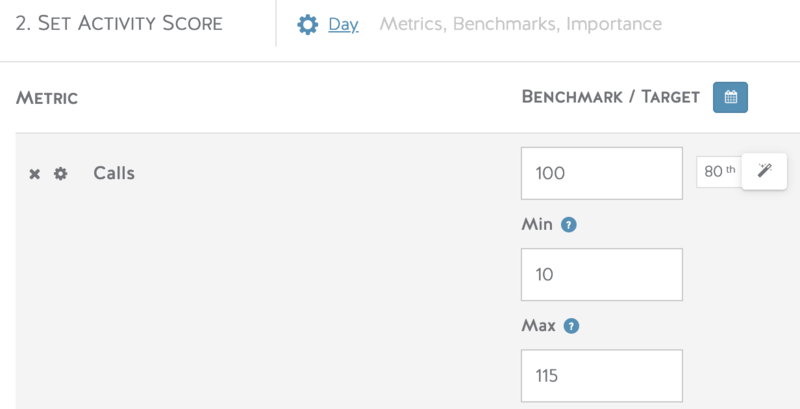 Scorecard Mins & Maxes - Advanced Feature: Managers can now set a Min or Max for specific activities and objects. Click on the gear icon to toggle advanced options. Min = Employee must reach this value before earning points. Max = Employee can no longer earn points beyond this value.